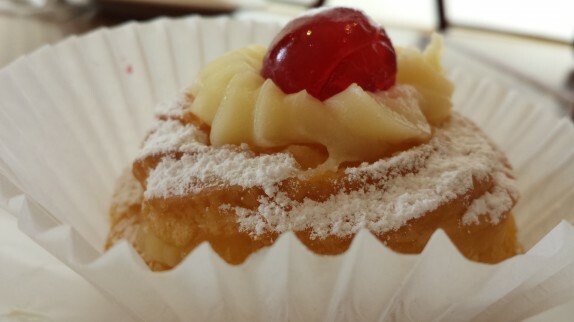 Two years ago, I wrote about how I fulfill my craving for St. Joseph’s pastries in the Captial Region. It usually involves a trip to Bella Napoli Bakery in Latham to pick up one of their halfway decent attempts at replicating the pastry honoring the feast of St. Joseph. 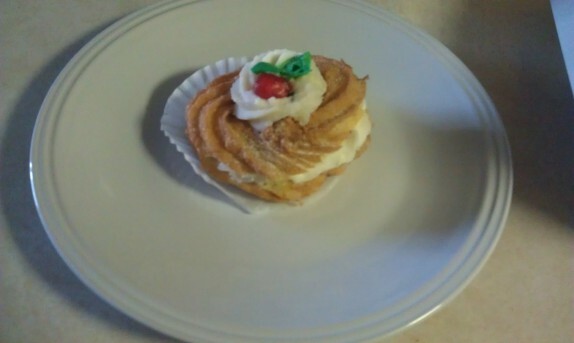 In my post from 2012, I also made mention of a degree of frustration stemming from not finding these pastries in a “famed pasticceria in Schenectady” around the day. 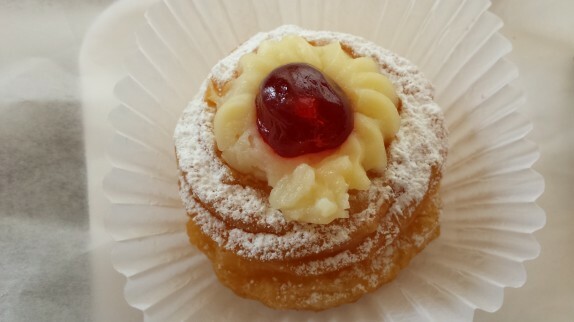 Well, on a trip to fulfill a random craving for sweets, I went to the pasticceria (Villa Italia), and I did find one variant of the St. Joseph pastry. Remember, since March 19 is my mom’s birthday (happy birthday, mom! ), the feast of St. Joseph, and specifically the consumption of these pastries was something that was big in my parents’ house. 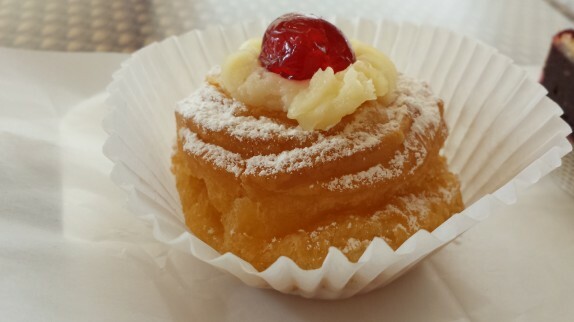 The variety I had at Villa Italia is the “zeppole” variety, and is filled with vanilla custard not unlike what you’d find in a napoleon or a good cream puff. From taking the first bite, even though the dusting of powered sugar atop appeared to be recent, it was clear my pastry had been filled well in advance to my bite. The bottom pastry was much more moist than the top, indicating some settling of some of the liquid in the pastry. Although the pastry was dense, it wasn’t overly sweet. The most frustrating part of the experience (as always for me) was the price of the pastry. Actually, I have no idea how much it costed. I purchased that and a second, less heavy pastry, and my total was over $7. Everything is sold by weight at Villa Italia, so this leads me to speculate that the St. Joseph pastry was somewhere between $3.50 and $4.50. For the size of the pastry, this is outrageous. 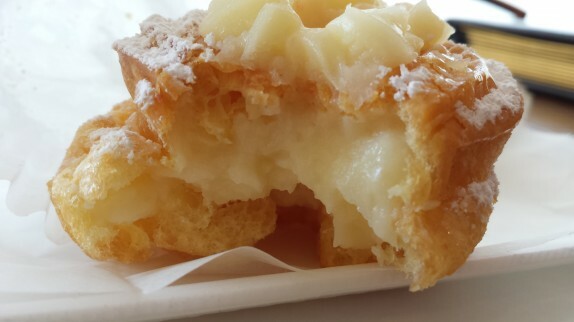 Bella Napoli’s pastry is 2-3 times the size and right around $3. I don’t care paying extra for a smaller portion of better quality stuff, but there’s no evidence for me to think that’s what’s going on here. Sadly, I must say Bella Napoli has Villa Italia beat on St. Joseph’s day. The Chocolate Mice there are the greatest pastry/dessert item I’ve ever had. If you haven’t tried one, you’re missing out. I’ve had it. It’s probably my favorite pastry there.